Trans Fats, aka BAD FATS are a type of fat that is produced by hydrogenation (= when vegetable oil is made intosolid fat) and is used in margarine, fried foods, etc. In other words this type of fat is processed. So avoid these things if you are trying to live a healthier life as they can lead to heart disease. Now, I would be lying if I said I never helped myself to some fish and chips or some delicious sweet potato fries, but it's all about balance! With all these amazing benefits you best stock up on nuts, fish, and avocado! If you are on the run and need a healthy snack that is tasty and helps give you that healthy fat you are looking for these fat balls are for you! They are quick to make and can be saved in fridge for up to 2 weeks and in freezer for up to a month so WHY NOT make em? 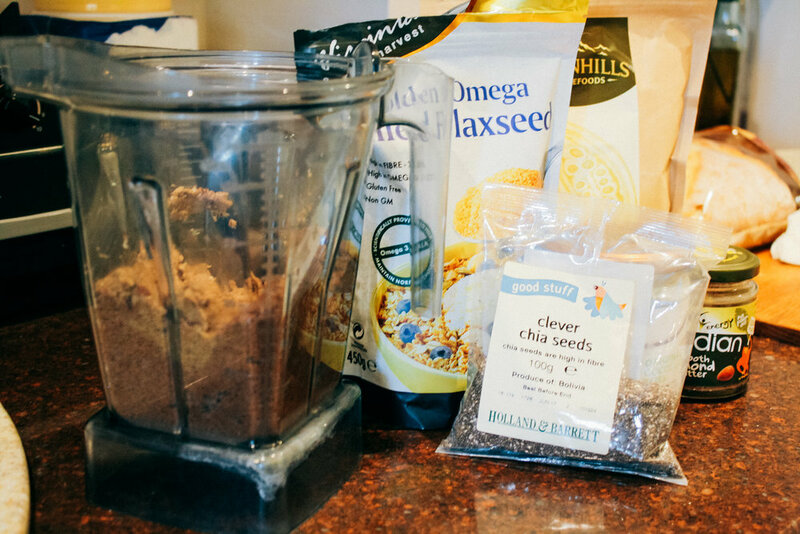 Place all ingredients in blender or strong food processer. If using vitamix, turn setting up to 10 right away or the motor can overheat. Figured this out 2x the hard way... If for some reason your Vitamix does stall on you. Allow it to cool down for 30 minutes and it should be good to go. Blend until the mixture starts to meld together. Add cacao nibs last minute or so so that it still maintains nib form.